The Friday Slatest newsletter: Two fatal campus shootings and a Nobel Peace Prize. 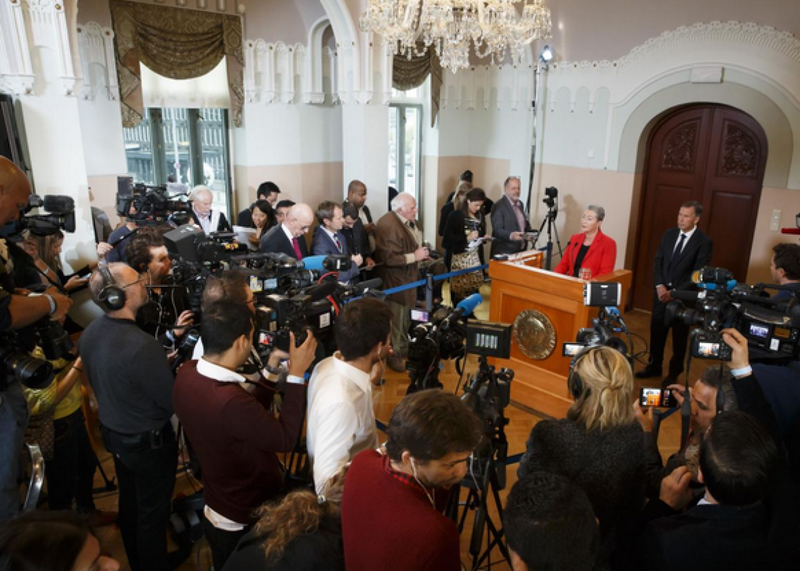 Kaci Kullmann Five, head of the Norwegian Nobel Committee, announces the winner of 2015 Nobel Peace Prize during a press conference in Oslo on Oct. 9. Josh Voorhees wrote that, contrary to a developing narrative, Marco Rubio isn’t actually doing that well in the polls. The South Carolina city of North Charleston agreed to pay $6.5 million to the family of Walter Scott, who was unarmed when he was shot and killed by officer Michael Slager after a traffic stop in a shooting that, as captured on a bystander’s video, did not appear to be justified. NBA player Thabo Sefolosha was found not guilty of all charges related to an April arrest in New York during which NYPD officers may have broken Sefolosha’s leg. The Pentagon shut down a massively expensive program to train anti-Assad Syrian fighters that had only trained “four or five” active rebels. And Ben Carson said the Holocaust might not have happened if it weren’t for Nazi gun control. Have a good day out there, I guess!